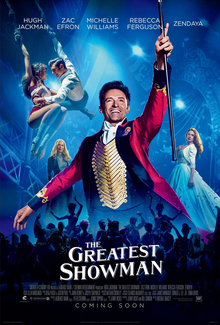 So we finally got around to watching The Greatest Showman - the movie whose soundtrack conquered the country before legitimate theater showings could begin. The MMDA-enforced delay in December disrupted the movie's official holiday release and we ended up with a late January one instead. I wasn't too excited about this movie since my knowledge of P.T. Barnum centered more about the controversies of his life and his reputation as liar given the rather spurious exhibits he put on display. But hey, there's nothing like a big movie musical to wipe that all away and let folks focus on the fun stuff and with some amazing songs too. We walked away from the theater having enjoyed individual songs and performances but not necessarily the story as a whole or how it was told. It gets complicated. Synopsis: The Greatest Showman is a musical drama movie directed by Michael Gracey. The screenplay had been written by Jenny Bicks and the songs having been written by Benj Pasek and Justin Paul. We first meet a young P.T. Barnum (Ellis Rubin/Ziv Zaifman) and his father Philo (Will Swenson) working as tailors in the Hartlett household. He froms a friendship with Charity Hartlett (Skylar Dunn), much to the disapproval of her father (Frederic Lehne). In time she is sent off to boarding school and P.T. is left to his own devices to find his way in the world. But he pushes hard and P.T. (Hugh Jackman) returns to take Charity (Michelle Williams) as his wife. But he can't seem to keep a job for long and the two are happy but struggling to make ends meet, especially with two daughters to support. Thus he comes up with the idea of creating a museum of curiosities as a possible attraction. He manages to talk his way to getting a bank loan and puts up his museum. But initially it isn't successful and the loans for the bank loom over the heads. But his daughters come up with the suggestion to have "living things" in the museum, and this inspired Barnum once more. What I Liked: Individual songs are amazing in this piece with many of them are able to stand on their own. By now you must have heard songs like "Never Enough" or especially "This Is Me". You can take any song from this movie and turn it into an anthem of some sort and that speaks well of Pasek & Paul. The accompany performances can be quite crazy but do make for great music videos. And there are some stellar performances as well and speaks of the talented team brought together for this movie. Hugh Jackman of course is a great actor especially in the transition between movies and musicals but there are some other talents that struck me as pretty awesome. The intensity of Rebecca Ferguson as Jenny Lind was truly powerful and I lover her performances as the opera singer. Keala Settle as Lettie the Bearded Lady is a powerhouse in so many ways and she captured the attention of the audience in any scene that gave her camera time. The list goes on. And Michelle Williams has gotten really good at playing sad yet loyal wives. What Could Have Been Better: The overall narrative of the movie feels overly simply and quite watered down. So muc work went into making each song performance stunning and spectacular but the link between scenes was tenuous at best. As a proper musical it didn't feel like the story flowed and the songs didn't help present the overall story. Character developmen was also terribly lacking as we don't really get why the supporting characters do one thing or another. And don't get me started on how the romance between Zac Efrong and Zendaya was presented. That made very little sense. There were quirky camera moments like how all the dance scenes were played slightly faster than normal, giving all the routines a weird frenetic pace. A lot of the songs were used to deal with montages of time passing quickly or slowing down without a lot of consistency in how things were suposed to work. There was just a general lack of internal coherence in terms of the storytelling experience. TL;DR: The Greatest Showman is a fun movie despite its liberties with the actual life of P.T. Barnum, don't get me wrong. Come for the powerful songs and the crazy performances but don't think too hard about what the movie is actually trying to say. Thus the movie gets 3.5 freaks, geeks, and other oddities out of a possible 5.